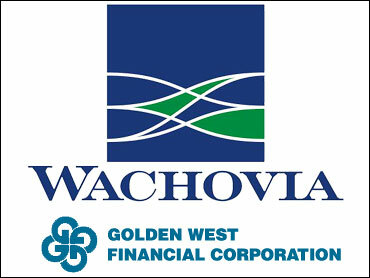 Wachovia Corp., the nation's fourth largest bank, is gaining its first major foothold in the West in a $25 billion deal to acquire Golden West Financial Corp. The stock-and-cash acquisition, announced late Sunday, values Golden West at $81.07 per share — 15 percent above the company's closing price last week on the New York Stock Exchange. That translates to a $25 billion price tag, based on Golden West's 308.5 million outstanding shares as of Feb. 28. With the takeover, Charlotte, N.C.-based Wachovia will pick up one of the nation's biggest mortgage portfolios and a 285-branch network spanning 10 states that will fill a void in the company's operations. Oakland, Calif.-based Golden West operates its branches as World Savings Bank — a brand that began to take shape 43 years ago when the husband-and-wife team of Herbert and Marion Sandler first bought a San Francisco Bay area savings and loan with just $34 million in assets and 25 employees. Golden West now has $125 billion in assets and employed 11,600 workers under the leadership of the Sandlers, now in their mid-70s, who are still the company's co-chief executive officers in one of corporate America's most unique partnerships. Wachovia has accounts established with 13.4 million households and businesses, but its 3,159 offices have been limited to 16 states concentrated in the East and South. Wachovia was built largely through takeovers of more than 80 banks and other financial-services companies, reports the Wall Street Journal. In 2001, the former First Union Corp. bought Wachovia for $14 billion and assumed its name. Wachovia's board approved the deal Sunday afternoon, reports The New York Times, while taking a break from the Wachovia Championship PGA golf tournament being held at the Quail Hollow Club near its headquarters in Charlotte, N.C.
Buying Golden West will enable Wachovia to enter the lucrative California market, growing rapidly because of the population influx, and establish its first branches in Arizona, Colorado, Illinois, Kansas and Nevada. Before deciding to pursue Golden West, Wachovia had eyed MBNA, the large credit card company, but that company was acquired Jan. 1 by the Bank of America. If the deal goes through as expected late this year, Wachovia will control about $669 billion in assets and deposits of $390 billion. It would rank fourth behind Citigroup, Bank of America and J.P. Morgan Chase. "We're very excited to partner with such strong management and with an extremely knowledgeable and diligent team of sales leaders," Wachovia Vice Chairman Ben Jenkins said. "Customers will continue to be served by the same dedicated and passionate people who have always met their needs — only over time, they'll have more products and services to choose from." The sale resolves the question of what will happen to Golden West after the Sandlers retire — a question that had been dogging the company for several years. Herbert is 74 and Marion is 75. "Wachovia is the company we selected to entrust with our legacy as one of the nation's most admired and trusted financial institutions," Herbert said. "We share the same values of operating with integrity, putting customers first and encouraging teamwork." The Sandlers own a combined 10.24 percent stake in Golden West, according to documents filed with the Securities and Exchange Commission. The sale will generate $2.6 billion for the couple. The Sandlers and Marion's brother, board member Bernard Osher, have agreed to vote their shares in favor of the sale, Wachovia said. Osher owns a 3.7 percent stake in Golden West. The deal calls for Golden West shareholders to receive a cash payment of $18.75 per share and 1.051 shares of Wachovia stock for each of their shares. Wachovia's shares finished last week at $59.39 on the New York Stock Exchange.